Hand crafted in Mornington from local and ethically sourced materials. Every piece of furniture in your home tells a story. Our pieces are custom designed to suit you perfectly – from the colour and pattern, to the length of the seat. Proudly made on the Mornington Peninsula. Everything is proudly made in our workshop on the Mornington Peninsula in Victoria. For those wanting furniture as unique as they are. We work with architects, interior designers and home owners with a distinctive eye for colour, original style and quality workmanship. Together we'll create furniture that you'll love for a lifetime. Servicing Melbourne for over 25 years. Sorrento Furniture’s Mornington Peninsula Furniture store is located at 10 Bennetts Rd in Mornington. We’re open Monday to Friday and we encourage anyone looking for a quality lounge setting to enhance their living space to visit our show room to view some of the finest custom-made furniture that Melbourne and the Mornington Peninsula have on offer. Just a short drive from Frankston we have a wide range of styles and fabrics to suit your living space. All of our custom-made furniture is lovingly crafted on site, so when you visit our furniture store our craftsmanship is on display. Whether you’re choosing from our core collection of stylish lounge settings for a beach house in Sorrento, acquiring a luxury piece of custom made furniture for a Melbourne apartment, or looking to restore a much-loved element of your suburban living space, Sorrento furniture can handcraft a solution to suit your needs. Our design process is all about you. We harness your ideas and focus them to create custom furniture instilled with your vision for your living space. Built with the finest attention to detail by expert craftsmen, we take pride in our work, and guarantee your final piece will be an enduring addition to your home. 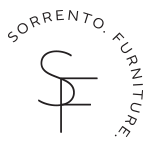 Built with ethically sourced and environmentally sustainable materials every Sorrento Furniture lounge setting or furniture restoration is completed using high-quality materials, hardwood timbers and durable fabrics that are designed to last. We invite you to visit our furniture store showroom in person, or enquire online or over the phone and talk to us about building a piece of furniture that you’ll love for years to come. If you're interested in unique quality lounge furniture give us a call us on 03 5975 0344 or enquire here.